The 6:45 am alarm sounds, but after a slow breakfast at the same joint as last night, we are finally on the road at just after 9am. It must have been a slightly downhill run, because we are in Afyon, 20 k south, in an hour. Although Afton is the natural town to get a bus back to Eskisehir from, Mark decides to continue riding with me. 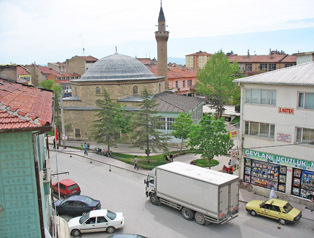 We decide to head to Bolvadin-a slight detour for me, but nice in that it will get us off the main road to Konya. Maybe my map's wrong, because we never find the secondary road from Afyon through Sulumenli to Cobaniar. Instead, 19 k east of Afyon we find a different route to Cobaniar, and take it. The countryside is nice, but we quickly regret the decision: we find ourselves sharing the road with a steady stream of painfully loud "tractor-cars." Not seeing any restaurants in Cobaniar, we stop at the gazebo next to a cemetery and enjoy the snacks we've been carrying for far too long. Somehow the next phase, the 24 k to Bolvadin, isn't fun. Some of it may be a slight headwind. Some may be burnout from yesterday's ride. Nevertheless, by 2pm we are at the big crossroads, where Mark and I will part. Mark needs to figure out where the bus terminal is, and soon enough we find it. Mark buys a ticket for a bus due in an hour or so, and I figure that we'll do a last lunch together before splitting ways. I ask Mark to ask about accommodations, and he learns that there is a pension in Cay, 12 k south. As we head out to find a place to eat, a terminal employee suddenly calls out to Mark, indicating that the bus that has just pulled in will work for him. A minute later he's gone. Cay is 12 k south, and where I'm headed, but I decide to cover my bases and ask someone else. This person doesn't think there is a hotel in cay, but says that this town has one, and points back to the highway, a half kilometer away. I decide that I'll stay here in Bolvadin, if I find a hotel. Shifting the 12 k to tomorrow won't make a difference since past Cay, likely hotels are in Aksehir, at 44 k, then Kadinhani, at another 73 k. Instead of heading back out to the highway, I head into town, in case there's something there. I check-out the downtown, don't see any kind of hotel, and slowly ride back out toward the freeway. Someone calls out "Hello, how are you?" and I stop, and ask about the hotels. I'm told "Follow me, " and it doesn't feel right - maybe like the commission game that Lonely Planet warns about is about to happen. But I'm not sure what choice I have. 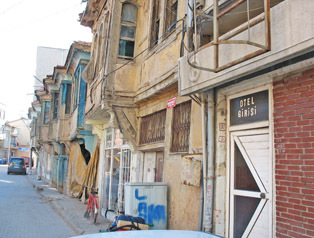 We take one side street, then another quick side street and there is a nondescript little door - "otel grates" - or "Hotel Enter". Hmmm… The two of us go upstairs. The place definitely was a hotel room, and I was offered a room with two beds but no toilet/shower for 15 Turkish Lira. Heck - I don't care if the room's been marked-up for some kind of commission or not - I jump on it. I shower, and then take the bike back to the highway roadhouse, where I eat, then head back into town. 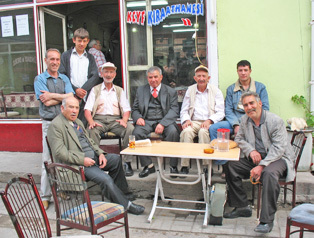 Wandering around, I'm called over to a chai shop where I end up hanging out and chatting, in my broken German, with some of the town elders. Among other things, I learn that there IS a hotel on the long stretch east of Konya. Mark helps his bike get shoved under the bus; then he's gone. Nice "Ottoman-style" homes. Can you spot the hotel? View from hotel room - I'm just off the main street. My friends at the chai shop.